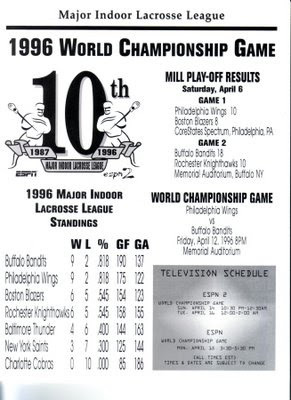 It just didn't seem like the same old Buffalo Bandits in the 1996 season, especially in goal. Pat O'Toole had played in two games for New York in 1995, and was acquired by the Bandits. Ross Cowie became his backup, while Bill Gerrie left the team. There were other new faces in front of O'Toole including Ted Dowling, Travis Kilgour (Rich and Darris' brother), Tom Pfair, future Rochester Knighthawks coach Mike Hasen, Neil Doddridge and top draft choice Jason Luke. In all, 12 new players were on the roster, and seven would go on to see significant playing time. In addition, Brian Hall took over from Jim Veltman as captain. Still, Les Bartley was around as coach, and he had a knack for winning. "The thing I remember the most about Les is that he was a real people person," Veltman said. "He let you believe that you came up with the ideas he tried to implement. He made you buy in. He made you think you were contributing, but he had in the back of his mind how he wanted to steer the conversation. He made up feel like we had a big part in what happened on the floor. That speaks volumes." The results were immediate. Buffalo beat the Wings in Philadelphia, 15-12, on Opening Night on January 12. O'Toole had 51 saves as the Wings' 15-game win streak came to an end. "The night before the game I could hardly sleep at all," O'Toole said. "I was very nervous because I was getting my chance as the No. 1 goaltender and I wanted to prove myself as a No. 1 goaltender. But I calmed down and things worked out all right." That victory was followed by wins over Baltimore, Boston, and Rochester. The Bandits moved to 5-0 with a 28-6 win over expansion team Charlotte, setting all sorts of team records in the process. "We buried all of our chances tonight," said John Tavares. "I have mixed feelings about setting the (team goal) record in a game like this. It's nice to get but we certainly didn't want to embarrass them. They're a first-year team and they're still learning. We just scored a lot of nice goals on them." Baltimore and Boston fell after that to put the Bandits at 7-0. Hopes of an undefeated season ended on March 16, when Rochester won in Buffalo, 17-14. "If you don't maintain your defensive intensity for 60 minutes, this is what happens," Bartley said. "Somebody comes into your barn and beats you." The Bandits divided their last two games, beating New York but losing to Philadelphia. "You could see we were getting a little complacent before we lost those two games," fifth-year forward Rich Kilgour said later. "As veterans, we took it upon ourselves to make sure all the younger players were back in the right frame of mind for the playoffs." The 8-2 season tied the Bandits with Philadelphia for the best record in the league, but Buffalo claimed first place on a tiebreaker. Tavares led the team in scoring with 81 points in the expanded 10-game schedule. Cordingley had 59 points, while Dowling chipped in 39. O'Toole played in 10 games and finished with a 7-2 won-loss record, setting a team record for wins in a season. Tavares and Veltman were first-team all-league selections as usual. Tavares led the league in scoring by a wide margin, but lost the vote for league MVP to Gary Gait of Philadelphia. Veltman maintained his standard of play despite living in Vancouver and commuting in for games. "We were pretty dominant," Veltman said about the season. "We had such talent on that team. It was unbelievable how much talent we had. It seemed all year that we were going to be unstoppable. It was hard for other teams to match our talent, to be frank. It was fun to go on the floor and be let loose." Buffalo's first playoff game came against Rochester on April 6, and the Bandits came up with an 18-10 win. Travis Kilgour was the game's most valuable player, as he had four goals. "Staying out of the penalty box was key for us," Doddridge said. "Tough defense is a lot easier to play when you know you're not going to take dumb penalties. It's something we talked about staying away from." Less than a week later on April 12, the Bandits and Wings inevitably met for the league championship. This time, the Bandits took their turn as champions. Buffalo won a 15-10 decision before 16,230 in the Aud to deny the Wings their third straight championship. O'Toole earned game MVP honors. "He's just like a piece of Teflon, everything just slides right off him," Dowling said of O'Toole. "He proved the last two weeks that he's the best goalie in this league, but I knew it all along. All-star teams are just popularity contests. Patty's the one wearing the ring now." Cordingley and Luke had three goals each. It was the last lacrosse game ever played in Memorial Auditorium's history, and Cordingley had the last goal for Buffalo in that building. "They denied us a chance to three-peat a couple years ago and it was a big thing for us to repay the favor," Cordingley said. "We showed that we were single-minded in our purpose, and that was to win back the championship for our fans." "It was pretty sweet to beat them right there," Rich Kilgour said. "That was the greatest arena ever to play in. I love how nice the new arena is but that old arena just had character. It felt like the fans were right on top of you." Dean Cecconi had the game-winning goal in the title game. He'll never forget that game, and that season. "I still wear the championship ring," he said 20 years later. "It's a memento of the best time of my life." That meant the Bandits had won three championships and played for a fourth in their five-year history. Not bad at all.